The wedding day is (conventionally, at least) a cherished day in a woman’s life. And every woman wants to look prettiest, most beautiful on the day of her wedding. They want it all to be perfect, their dress, their makeup, and of course, the jewellery they wear. Whether it's about necklace, bracelets, or Maangtika, women want everything to be perfect especially on their wedding day. And while each chunk of your jewellery is as important as every other chunk, a good pair of judiciously chosen best earrings for weddings can elevate your looks to a wholly different level. This wedding season, jewelry designers have come up with some really intriguing earring trends for the brides to be and their friends, of course. We would be sifting through some of the best earrings for weddings trending this season in the market and also have a look at the collections of bridal earrings online. 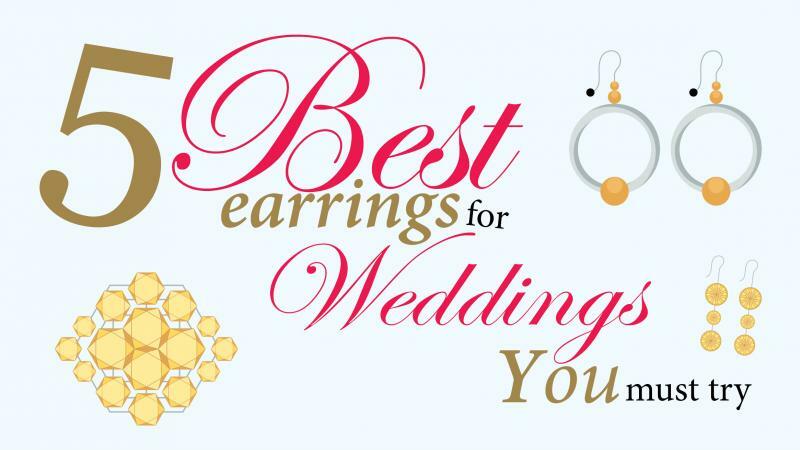 And if you are not getting married just yet but are the best friend of a bride to be, we will also look at some awesome earrings for wedding party that you can flaunt on your friend’s special day without stealing her thunder. These are indeed some Handmade Jewelry Under Budget. Chandelier Earrings or Jhumkas as we call them traditionally beat all the other options for a wedding out of waters. These earrings look too good to be missed out on with traditional attires like saris, lehengas, and kurtas. If you are wearing a deep colored lehenga or a sari for your wedding, you could go for gold or silver chandelier earrings. These earrings come in a variety of designs and sizes and you should choose one depending on your outfit as well as the size and shape of your face. You could also choose diamond studded chandelier earrings for a light-shaded dress. If you are just a guest and do not want to be very extravagant in your choice, you can also choose fusion material chandelier earrings. Fusion earrings nowadays are being made from materials including silver, fusion metals, beads, pearls, and even wood and strings. These beautifully crafted earrings help you get that perfect look without burning holes in your pocket and look no less beautiful than their expensive counterparts. If you are not opting for an entirely traditional wedding attire and are going for a fusion between modernity and tradition, crystal earrings are just the thing for you. If you are ballsy enough to be a blingy bride, you can opt for beautifully studded crystal earrings. Just make sure to keep your attire relatively plain. These earrings go well with ivory, baby pink, and peach colored bridal outfits. If you are going to be the bridesmaid, these earrings are just perfect for you. The crystal-studded earrings go very well with traditional as well as fusion outfits and no matter what you choose to wear for your bridesmaid duties, these studded pairs will continue to draw eyeballs to you throughout the party. Danglers are the most fashionable variants of earrings and if you are going to wear a deep neckline attire for your wedding, these could be the real day-savers for you. Nothing complements a low neckline better than a long pair of danglers. Especially if you have a round or oval face, the danglers were just devised for you. No matter your choice of attire, a well-chosen pair of dangler goes well with all outfits. You can wear a deep neck gown with a stylish, low dangling pair or a low-cut blouse with a heavy dangler. Go minimal with the neck piece when flaunting these designer pieces. People with a long face cut should avoid wearing them as they make the face appear longer than usual. Studs are just the things tailor-made for a minimalistic bride. If you are looking forward to sport a simple yet elegant, classy look for your wedding, you should definitely go for these awesome lobe-hugging pieces of jewellery. You can choose big crystal, diamond or stone studs to wear with an extravagant dress or a flashy necklace. If you are looking for a fusion of western and traditional looks, studs are perfect chunks of jewellery. You could flaunt them with a fusion gown or with a well-embroidered lehenga. You can also wear them easily to wedding parties without having to worry about coming out as too flashy, because of the elegant simplicity of this earrings. Largely seen as statement jewellery, ear cuffs have emerged as an interesting choice for the modern, bold brides. These ear-line hugging ear cuffs come in both traditional and modern designs and can be metallic or studded. You can go for a gold or silver metallic pair to wear with your lehenga or sari. if you are planning to opt for a gown then what is better than a studded pair of jewelry? You can easily wear these trendy jewellery pieces at wedding parties. Just make sure to not overdo your look. Keep your attire beautiful yet simple if you are going to wear a big and detailed ear cuff. If you are wearing a simple one, go for brightly designed outfits. Any woman’s collection of jewelry is perhaps her best friend, a resource of sorts not only meant to adorn her appearance make her look good but also to make her feel good. And it is very important that you feel good about your D-day. You can always play with your looks, pairing one thing with another. The above-mentioned trendy earrings provide you with a choice to go modern or traditional according to the occasion. Plus they are easy on your pockets as well. You could easily pair them with different outfits to experiment and get an entirely new look. Too much to wait for, right? so if you are looking out for simple yet brilliant earrings then sites like Showflipper are recommended online stores.